Note: Prescribed barbell weight for men is 95lb. and women 65lb. Each round will be individually timed. The goal is consecutive repetitions at each weightlifting and gymnastics stations. This is a sweet session. Congratulations and a “well deserved” to Cody who was recognized as Athlete of The Week. 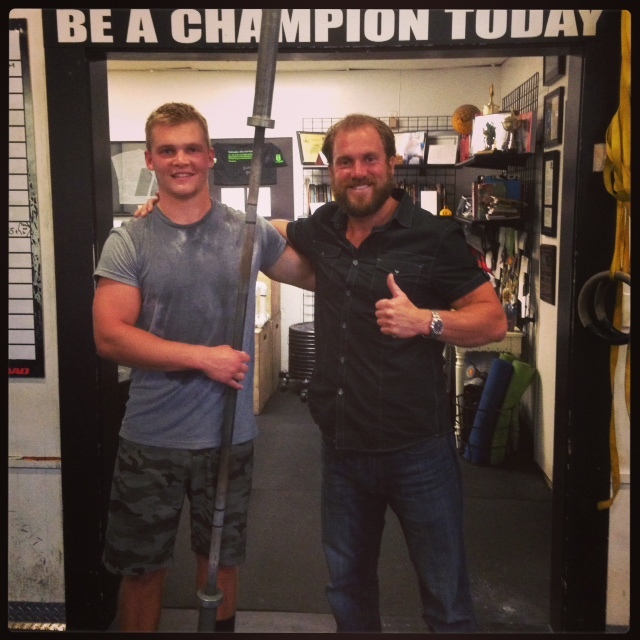 Cody consistently, with a humble attitude, sets gym records in both weightlifting and gymnastic skills. Of special mention was his incredible 40 consecutive Pull-ups following a 400 meter sprint and 21 Kettlebell Swings. Cody is extremely disciplined with his entire training program, to include technique and skill work (Cody attends Olympic Lifting Class twice a week) his nutrition (Cody brings tupperware with Zone meals to the gym and to work) and his stretching and mindfulness (Cody attends Warrior Body Zen Mind Yoga Practice.) Thank you for being such an inspiration to everyone in the gym Cody, and keep up the amazing work.